Home > News > Micromanaging Pain? What are the root causes of pain? The search often ends at ion channels and other regulators of neuron function. But another question lies just beyond: What regulates the regulators? Evidence is gathering to suggest that in some cases, microRNAs may call the shots, controlling expression of the protein players. Now, a new study demonstrates in an animal model that a specific microRNA does, in fact, regulate pain. Researchers found that microRNA miR-103 modulated expression of the three subunits of calcium channel Cav1.2 and controlled calcium influx in spinal cord neurons. In a rat model of neuropathic pain hypersensitivity, administering miR-103 alleviated pain. The paper, from Alexandre Favereaux and colleagues at the Université de Bordeaux in France, appeared online July 29 in The EMBO Journal. First reported in 1993, microRNAs (miRNAs) are a class of small (~21-25 nucleotide), non-coding RNAs that repress gene expression via interactions with messenger RNAs (mRNAs). MiRNAs can trigger destruction of bound mRNAs or prevent their translation. Either way, their role in gene expression is likely to be substantial, given that miRNAs are estimated to target approximately 30 percent of human genes. (For reviews, see Du and Zamore, 2005; Huntzinger and Izaurralde, 2011.) In neurons, where local regulation of translation is crucial to cell function, miRNAs have particularly important roles. Previous studies have demonstrated miRNA involvement in dendritic spine morphology (Schratt et al., 2006) and synaptic function (Edbauer et al., 2010). In the new study, Favereaux and coworkers used bioinformatics to identify miRNAs that might target transcripts encoding the Cav1.2 subunits α1, α2δ1, and β1. All three transcripts showed potential binding sites for miR-103. As predicted, overexpression of miR-103 in spinal cord neurons downregulated expression of the three Cav1.2 subunits; conversely, depleting miR-103 using an oligonucleotide inhibitor increased Cav1.2 levels. Calcium imaging showed that the changes in channel expression had functional relevance for the cells. Overexpressing miR-103 in rat spinal cord neurons in culture decreased stimulus-dependent calcium influx, and depleting miR-103 increased the signal. In rats, depleting miR-103 via intrathecal injection of the inhibitory oligonucleotide made the animals more sensitive to painful stimuli, lowering the threshold for paw withdrawal from von Frey filaments. That result indicated that in normal animals, miR-103 helps to temper pain sensitivity. To investigate the role of miR-103 in neuropathic pain, the researchers looked at rats following spinal nerve ligation (SNL). They found that after SNL, miR-103 levels in the dorsal spinal cord were slightly but significantly diminished, and Cav1.2 mRNA levels were increased. The observation was consistent with the idea that a decrease in miR-103 may contribute to neuropathic pain by allowing upregulation of the calcium channel. To test that possibility, the researchers administered miR-103 to the injured rats by intrathecal injection. That caused levels of all three Cav1.2 subunit transcripts to drop. It also alleviated pain: Animals were hypersensitive to mechanical stimuli and cold temperatures after SNL, but after miR-103 injection, their sensitivity crept back toward levels seen in healthy animals. The results on miR-103 join a small but growing body of literature connecting miRNAs to pathological pain (for a recent review, see Niederberger et al., 2011). Profiling experiments are beginning to document how miRNA levels change in a variety of human painful diseases and animal pain models (for recent examples, see Hawkins et al., 2011; Kusuda et al., 2011; Poh et al., 2011; von Schack et al., 2011). Last year, a study in mice indicated a causal role for regulatory RNAs in pathological pain by showing that deleting Dicer (an enzyme that produces miRNAs as well as small interfering RNAs) in a subset of nociceptive sensory neurons diminished inflammatory pain while leaving acute pain responses intact (Zhao et al., 2010). In addition, several studies have teased out functions for individual miRNAs, including let-7 as a repressor of μ opioid receptor expression and a contributor to morphine tolerance in mice (He et al., 2010) and miR-146a as a regulator of inflammatory cytokines and other pain mediators in human cells (Li et al., 2011). The study from Favereaux and coworkers adds to the story by showing that administering an miRNA, at least in rats, can actually alleviate pain. Favereaux is particularly interested in the ability of a single miRNA, miR-103, to control multiple proteins that work together. Now, he and his coworkers are conducting large-scale studies aimed at finding more examples of this sort of integrative regulation. By cataloging expression levels of miRNAs and mRNAs in spinal cord tissue from animal models of neuropathic pain, they hope to find patterns of inverse expression that indicate miRNA-target relationships. 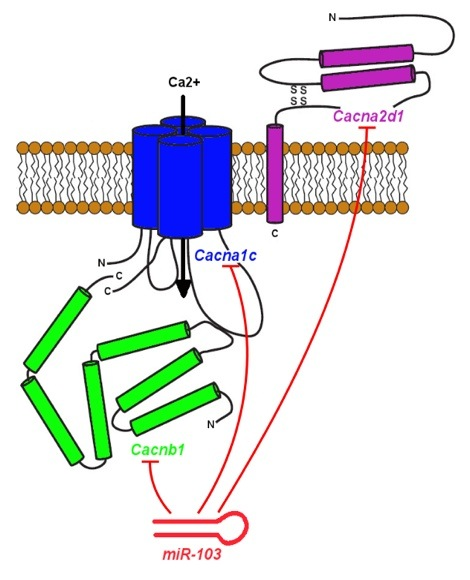 Bidirectional integrative regulation of Cav1.2 calcium channel by microRNA miR-103: role in pain. EMBO J. 2011 Sep 14; 30(18):3830-41. Epub 2011 Jul 29.